A base flange fixing for use on sloping sites. This piece is adjustable from 0 - 11 degrees and is often used with guardrail and wheelchair ramp uprights tubes. The fixing holes on this part are designed to be suitable for a wide range of common mechanical and chemical masonry anchors. Dimensions indicated in the image are in millimetres. 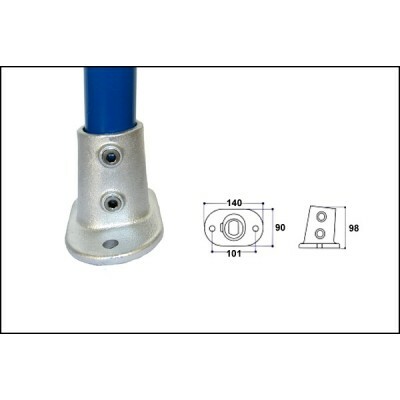 This part must be fitted with the fixing holes positioned in line with the applied load to be able to achieve its optimum load characteristics.